Detail-obsessed filmmaker Stanley Kubrick was famously guarded about the props he used in his motion pictures. There’s a reason, for instance, that the monolith from 2001: A Space Odyssey never turned up on the auction block: Kubrick supposedly had the thing destroyed after filming was completed. That was also supposedly the fate of the pointy, three-dimensional bedspread belonging to thuggish but charming protagonist Alex (Malcolm McDowell) in his 1971 film A Clockwork Orange. That dystopian sci-fi film is rife with odd fashions, hairstyles, home furnishings, and artwork, but Alex’s one-of-a-kind blanket, with its red, orange, and yellow cones, still manages to stand out and make a lasting impression on viewers. One such viewer, YouTuber DJYarBlockO took the extra step of recreating the famous coverlet in the third (and apparently final) episode of a web series called Crazy Making Behavior. Since the original was no longer available for comparison, the process of making a second Clockwork Orange blanket began with a thorough study of the movie. 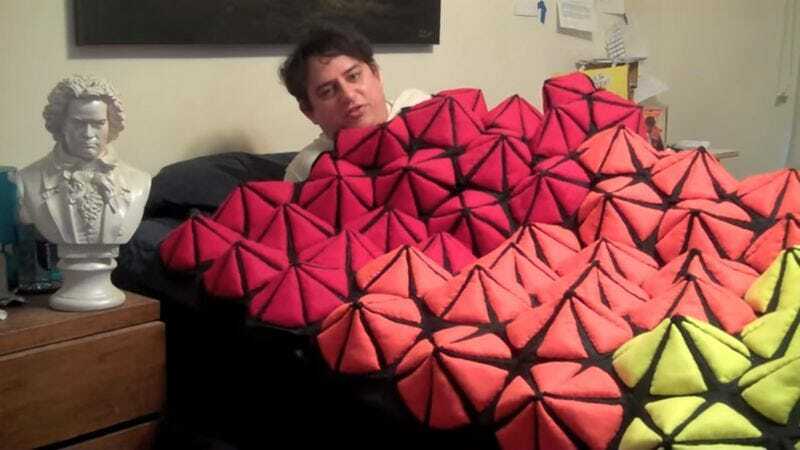 This revealed that Alex’s bed cover is composed of 73 “tented hexagons,” each one eight inches in diameter. Having made his calculations, DJYarBlockO decided to forego the neoprene that Kubrick used in favor of craft felt procured from a nearby fabric store. (He went to Mood, for those of you that watch Project Runway.) The puffiness was provided by couch foam. To hasten his progress, this fan made his own template and even created a piece of wood to make “uniform pie wedges.” There followed half a year of obsessive cutting and sewing. The project became quintessentially Kubrickian in its detail, much like typing the same sentence over and over again or running through every possible permutation of a three-letter code prefix. But, after countless hours of tedious, repetitive work, the hobbyist wound up with a replica that strongly resembles the blanket in the movie and seems pretty comfy as well.